Above the Sázava valley and near the town of Čerčany, 40 kilometers from Prague, a remarkable two-story home designed by the architects Jiří Smolík and Zdeněk Rychtařík rises out of the slope. Open inside and out: expansive glass walls open the interior to the exterior. 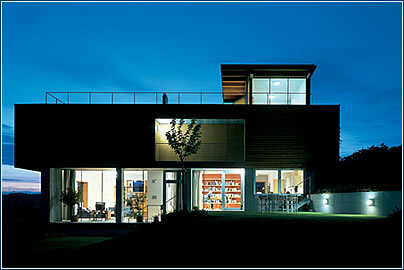 FINISHED IN 2000, the house is unique in terms of materials used, external appearance and internal arrangement. The unplastered architectural concrete on the glassy ground floor looks raw, but the facade of the overhanging second floor, sheathed in wooden planks, provides a warmer feeling. 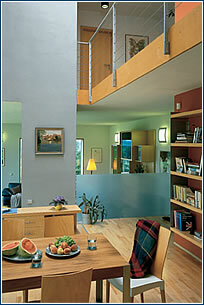 The study that constitutes the third floor is reminiscent of a captain’s bridge. The construction authority initially considered the project overly audacious, but the owners were able to push through a change in the land plan. The result is a stylistically clean building refined down to the last detail, including custom-made furniture. The ground floor does not follow the classic layout of rooms – division of spaces is only suggested. The open gallery above the dining table optically unites the ground floor with the second floor. 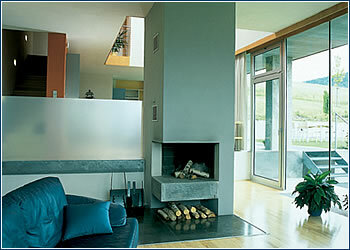 The fireplace also follows the functionalist concept, appearing to be cut into the horizontal ashlar of the chimney. 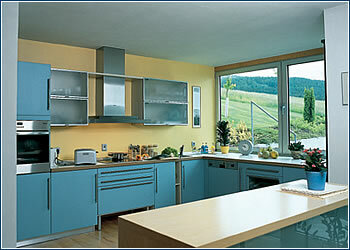 The blue and ochre kitchen has modern fittings, as does the rest of the ground floor, but otherwise it does not differ much from a typical kitchen. 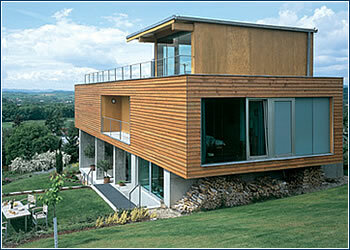 With its stepped structure the building fits into the undulating land, which makes it stand out. The landscaping is stylish, but also simple and effective. Under the rear overhang, wood for the fireplace is stored. You worked out the details of this house, which has won awards abroad. What does it mean to you, and what was your cooperation with the owner like on such an unusual project?